Stand firm on the solid rock-Jesus. Once your feet are set on the rock, there is no basis to fear sinking(well, except you are not sure on what you are standing on). If you know how great your God is, nothing can shake you. Firstly, when you are standing still, you are not to do that idly. You must be considering the works of God. (Hear this, O Job; stand still and consider the wondrous works of God- Job 37v14). Remind yourself of the glorious things He had done in the past. Ruminate on His wondrous acts. Look around you, look at nature; read your Bible and meditate on the awesome miracles He wrought and remind yourself of the battles He has fought for you. There is this song I learnt when I was younger- “I know whom I believe, I worship the Lord; He’s the Alpha and Omega, He’s the beginning and the end.” God is able to do just what He says He will do. He has the power and authority. With Him, nothing is impossible. Always remind yourself that nothing is too hard for Him. If something you are trusting Him for has not come through, it is not because He cannot do it, it is simply because He is in control of the timing. He always knows best. Keep praising Him till He decides to raise you! Secondly, when you are standing still, there is no need to fight. The battle is not yours. It is time for you tou trust God completely. God does not need your help to make you conquer. Don’t try to rush God or make or follow shortcuts to the solution. Only God’s blessings add no form of sorrow. His works are always perfect. He does not want to share His glory with any man. Allow Him take full control. Don’t allow Him take the steering wheel while you are busy trying to manipulate the geer. Sit majestically at the back sit and relax. Simply follow Him. Let Him lead you at His own pace. The story of king Jehoshaphat in 2 Chronicles chapter 20 captures this message properly. What could look more stupid than going to battle with musical instruments when your enemies are bringing their guns, missiles,etc. Oh my God! God uses the foolish things of this world to confound the wise. As a matter of fact, someone who God led to battle with no physical armour must have a more groundbreaking testimony than someone He equipped with the physical armour to face terrible enemies with sophisticated weapons war. Wait for Him. As long as it is God that is at the fore of that battle, you have nothing to fear. You are more than a conqueror! 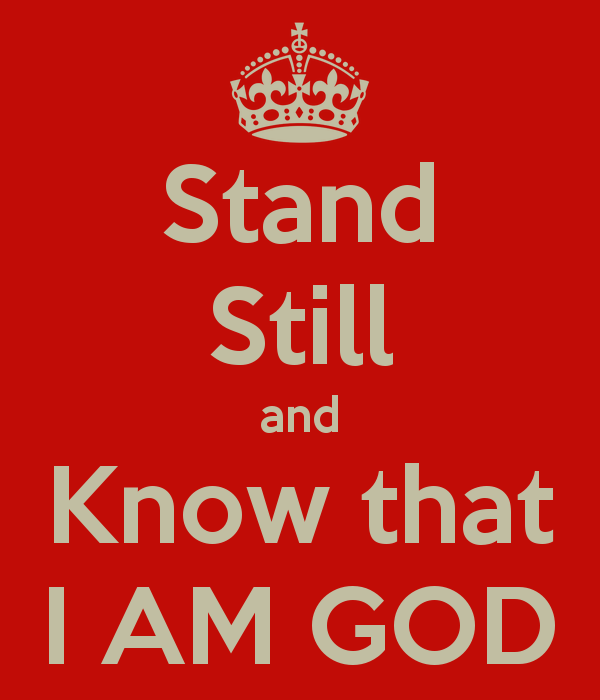 Stand still and know He is God!